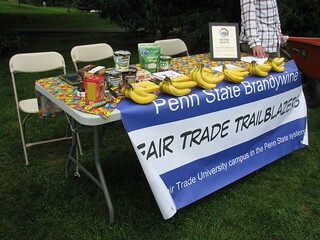 The “Go Bananas for Fair Trade” event at Penn State Brandywine, a nationwide campaign organized by Fair Trade Towns USA, was a huge success! As we continue on our journey as a Fair Trade University, we continue to work this fall semester toward raising awareness of the Fair Trade movement on campus, specifically with the first-year students, staff and faculty. On October 9-10, 2012, we hosted an event where campus and community members could come to campus and receive a FREE Fair Trade banana, information about the different Fair Trade labels, and take a Fair Trade banana quiz on an iPad. Be sure to read about the lead up to our event and the resulting success! We hope that our experience can help other campuses learn how to best host a Fair Trade banana event! For starters, we consulted the Go Bananas website and found their Resources page for setting up a banana event. This was very helpful! But there were some other considerations we had to make, especially doing this event on a college campus. Get permission first! We CANNOT stress this enough! Our campus has rules with regards to food and food service on campus, and we are sure yours does as well. Some schools may require that all food be ordered and/or served through your dining services on campus. We received permission from the business office on campus to obtain the Fair Trade bananas from off campus and to distribute them. Get the word out. As the Go Bananas campaign ran the first two weeks of October, this was far enough into the fall semester so we were not still trying to get the semester under way. We used our campus’s social media sites our own social media sites, as well as the template from the Go Bananas website to create 11×17 inch posters with the banana logo/template. Our local town’s Fair Trade committee was kind enough to include us in an announcement sent to our local paper. It worked! In a two-day period, we were able to distribute all of our bananas. Consider running the event for more than one day. We scheduled the event over two days, as we are a commuter campus and some of our students are only on campus Mondays/Wednesdays/Fridays, while other students are only on campus Tuesdays/Thursdays. By having the event over two days, we were able to reach as many student across our campus population as possible. Expand your volunteer base – connect with a faculty member/course. Early in the semester, we had a faculty member that teachers Introduction to Business ask if her students could help out with the Go Bananas event. This was a first for the Fair Trade TrailBlazers, having a faculty member be proactive in contacting us and getting her students involved. 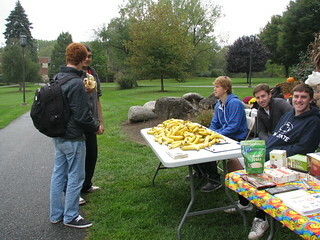 We decided that after we secured the bananas, we would let the business students RUN the event! This was a great opportunity for us to spread the Fair Trade message to 40 first-semester freshmen in the course and to grow our volunteer base. These students have been asking more and more questions about Fair Trade, and we bet we are going to see them at our future events! Purchase more bananas than you think you will need. We actually ran out of bananas before the second day of the event was complete. 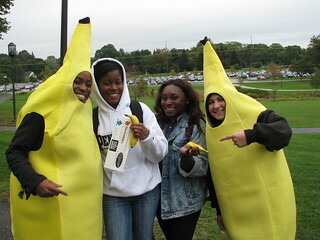 Our original plan was to just distribute one banana per student/staff/faculty member, but we couldn’t say “no” to the handful of students that asked for bananas and flyers to provide to family members (again, we are a commuter campus where most of our students still live with their families). This provided us an opportunity to spread the “fair trade” message beyond campus! Think about jazzing up your bananas with additional ingredients. We wanted to do chocolate-covered bananas, but we couldn’t figure out how to have warm, melted Fair Trade chocolate in the location we were doing the event for people to dunk their bananas in. We saw some photos online of other universities doing some innovative slicing of bananas and pouring chocolate and sprinkles on top – what fun! We think taking our event to the next level with more “trimmings” next time will bring a new twist for us the next time, to bring more people back for more bananas. Choose a good time, overlap with the breakfast/lunch hours. We set our event at 10AM to 1PM both days, so that people could grab a banana between our morning classes and when they arrived on campus. Don’t be concerned if you don’t have a large group right when you begin, as people will filter in during the event – most likely, as we say, different students in the morning than over the lunch hour. Choose a good location on campus. Typically, most groups on our campus set up tables to promote events right outside the doors of the building that has our cafeteria and athletic center. We decided to set up outdoors in the center of campus, right next to our Lion Shrine statue. This allowed us to be visible as students left most of our academic buildings between classes, and we could “spread out” and direct people walking on sidewalks to walk over to our display to grab a banana. We certainly feel that location, location, location really mattered! Have a backup plan for bad weather. We booked an indoor location to give out the bananas, in case of really bad weather. Well, it actually ended up raining BOTH days of our event, but a little wet weather kept us outside and our energy was not dampened – we still had a successful event! The only part we were disappointed with was that because of the rain, not many students stayed by our tables outside to eat their banana, they went inside instead. Have a banana costume (or two). We had two banana costumes (Halloween costumes) available for students to wear. At first, we were not sure if anyone would wear the costume, but then it turned out we had more students that wanted to wear the costumes than we could manage! Having very energetic students willing to go around campus in the costumes really helped pull people over to our tables and added alot of fun to the activity. We were a popular spot for photos! Include an education component. We gave out a half-page flyer with every banana that provided some websites that talked about Fair Trade bananas and a list of where Fair Trade bananas can be purchased locally. We also included an information table (pictured below) with samples of products and another handout listing the different Fair Trade certification labels and describing what these labels mean. We even created a banana quiz for people to take on the iPad, which provided a fun way to bring technology and an interactive activity to the event. Include an advocacy component. Our original plan was to have a petition for our students to sign to get our campus dining services to serve Fair Trade bananas – but, as it turned out, they started serving Fair Trade bananas the week we had our event. 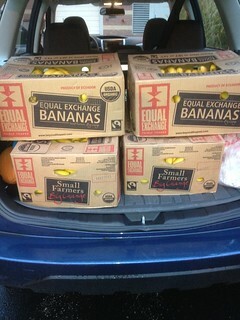 We’re thrilled that they are STILL serving Fair Trade bananas, and we hope this lasts the entire academic year. Be environmentally responsible – compost those banana peels. We checked with the head of our campus landscaping, and it turns out he has two compost piles on campus. He was more than willing to provide a wheel barrel for us to collect the banana peels so he could compost them (see photo). This was a nice addition to our event and our campus environmental mission. Take lots of photos, and share the results. We took pictures and tweeted them during the event and posted a collection of photos in our flickr account after the banana event. It’s a great way to document what we did and to share the results with others. We hope the conversation continues and people are inspired to try their own event after seeing and reading what we did! As part of the Go Bananas for Fair Trade campaign, Ten Thousand Villages on State Street in Media, PA, will be hosting a Going Bananas Cook-Off! During “Second Saturday,” October 13, bakers/chefs are asked to bring their Fair Trade banana creation, made with at least two additional Fair Trade items, to the Ten Thousand Villages store on State Street before 12:30PM. All entries will be judged between 1PM and 4PM by the staff and store customers based on use of fair trade ingredients, presentation, creativity, and taste. To find Fair Trade bananas locally, please visit Whole Foods, Swarthmore Co-op, or Martindale’s Natural Market in Springfield. Most Sam’s Clubs in Pennsylvania and Delaware also sell Fair Trade bananas. Happy Fair Trade Month everyone! We’re pleased to be able to participate in the 9th annual Fair Trade month. This is the first time Penn State Brandywine is joining the national voice during October in making ethical purchases to provide a “hand up, not a hand out” for workers across the globe. Fair Trade USA has some helpful hints with 10 Easy Ways to Celebrate Fair Trade Month, and we have found our own ways to get involved appropriate for our campus community. First up – we are Going Bananas for Fair Trade! We are joining the Fair Trade Towns & Universities campaign with what we are sure is going to be a fun event on campus. We’ll have 400 bananas to give out to 400 people to consume, along with an information table to educate people about where to purchase Fair Trade bananas locally, learn about Fair Trade labels on products, and even take a banana quiz on iPads! If you are in the area, feel free to swing by our campus (Penn State Brandywine) between 10AM and 1PM on October 9 and 10, and look for us at the Lion Shrine in the middle of campus. We are going to be environmentally responsible with the 400 banana peels – we will be composting all those peels on campus! Look for photos during our event on our social media sites. Next up in Fair Trade Month – our second Fair Trade t-shirt exchange! This event was so popular in the spring semester, we are back asking for slightly worn t-shirts to be swapped for a Penn State Brandywine Alta Gracia t-shirt (yes, these shirts will say Brandywine on them!). All collected t-shirts will be donated to Planet Aid. Stay tuned for dates and times of the event in late October. At the end of the month, Dr. Laura Guertin and one of our original Fair Trade TrailBlazers, Sarah DeMartino (now at the Penn State University Park campus) will be attending the Fair Trade Campaigns Conference in Chicago. Look for them to bring back more innovative ideas for education/awareness/advocacy of Fair Trade! Wednesday (August 15, 2012) evening, Fair Trade Towns USA hosted a webinar about their Go Bananas Challenge and went over some tips for effectively using social media for spreading Fair Trade awareness during Fair Trade Month in October and during the rest of the year. We were particularly interested in the Go Bananas Challenge portion of the webinar, as the TrailBlazers are hoping to participate and host some events on campus, but the discussion on social media tips turned out to be just as helpful. Fair Trade Towns USA pointed out a Tool Kit they have on their website for brainstorming ideas for events, hosting events, and a wealth of other information. Our plan, at this point, is to do something with Fair Trade Banana splits (can you imagine… Fair Trade Bananas, Fair Trade ice cream, and Fair Trade chocolate sauce! ), though we are still muddling through some logistics and other ideas. We’ll post more about our exact plans closer to October (and after we meet with our food vendor on campus), but the webinar got us thinking about what events might be doable, how do we want to educate our campus population, who we should be contacting, etc. We hope that the Tool Kit above is as helpful for everyone else as it was for us! But, the point we are most eager to share and blog about is actually the social media aspect of the webinar. Obviously, the TrailBlazers have been very much active in the social media world, and we are always looking for tips and ways to improve our outreach. We found two points in particular to be helping, but for the full guideline list, click here . One point that really stuck out to us was food. Food posts and photos are some of the more popular topics in the world of social media. A significant chunk of the hits and likes on our own website have been for our food events and recipes, and we had wondered for a while if this was just a phenomena we were experiencing or if it was a common occurrence in the wider community. Fair Trade Towns USA confirmed that food is a hot-button topic on the internet, and people love to look at food and talk about food. Luckily, when talking about Fair Trade, food comes up often, so sharing food related posts is easy and a great way to get people engaged. As budding social media users, all of us TrailBlazers recommend adding some food flair now and again to get people’s attention. Fair Trade Towns USA also talked about the power of a positive post. Positive posts get more retweets and shares than negative posts, and in the world of Fair Trade, shining the movement in the best light is important for keeping consumers and the general public feeling good about Fair Trade. We especially liked these points because they can easily be tied into the Go Bananas Challenge. In addition to hosting events, we need to effectively get the word out there, and social media has been a wonderful tool for getting people aware of what we’re doing and involved. Getting our campus involved with food while educating on the positive impacts of Fair Trade bananas will hopefully get more of our community (and the wider community!) involved with Fair Trade.